Hi Aileen! I'm going to India for training to be conducted by our vendor IT company. I'm just not sure if I should get a tourist visa or a business visa. Which one do you think should I get for this purpose? Thanks. Good for you.. your online application went so smooth. Not really good for me. Have completely filled out online application since April 2 this year, but payment process seems to be very complicated for me. I have made twice attempt to pay using my Visa Debit Card, but SBI e-payment have not accepted my payment. Upon subsequents attempts, and there were actually many of them already, I cannot go directly anymore to the SBI e-payment page to process the payment. Upon selecting SBI mode of payment, I am directed repeatedly instead to this page which says that my payment has not been received and that I should try again through E-Visa Payment page. I am like stuck to that page, andI have no Idea how to proceed to SBI payment. Can't also have access with Axis. I have already e-mailed them through an e-mail provided which I can contact for clarification. But I haven't received any responses yet since yeaterday. It's already 8th of April today, and my India travelled is set on 16th of the same month. I'm starting to sink in that I won't make it. Opportunity wasted. I'm so sorry to hear that! Have you checked with your bank? Maybe there might be something wrong with your card. Otherwise, I'm so sorry to hear this. I hope they would reply to you soon. If it still doesn't work, you can always go to the nearest Indian Embassy in your country to talk to them. Good luck! Hello Gibran! I experienced the same case as yours. In such case, you will need to redo the application again because they only allow 3 attempts in the payment page. It is written as note in the window before the payment page. Hope this helps. This is blog is really helpful. I am trying to apply for Indian visa right now and I have a question about the application. 1. My given name in the passport is hyphenated (J-J) but the site won't allow special characters so I can only type in (JJ). would this be a problem since what is in the application will not be exactly as in my passport? 2. I am from the Philippines but I am not sure what the citizenship/National ID should be. Shall I type NA? Hey! I think that should not be a problem (since they'll see your scanned passport anyway), and yes you can put N/A under the national ID section since we Filipinos don't have that. Good luck! Hi Aileen! 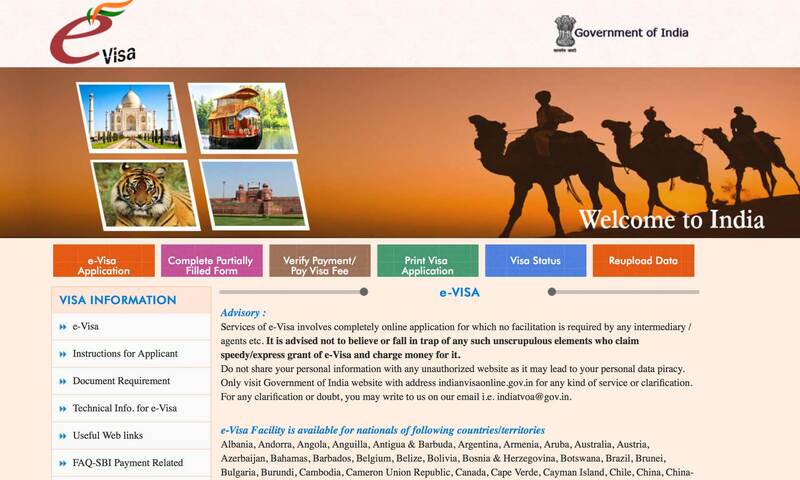 Thank you for the step-by-step details.My first e-visa application was done in the agency. 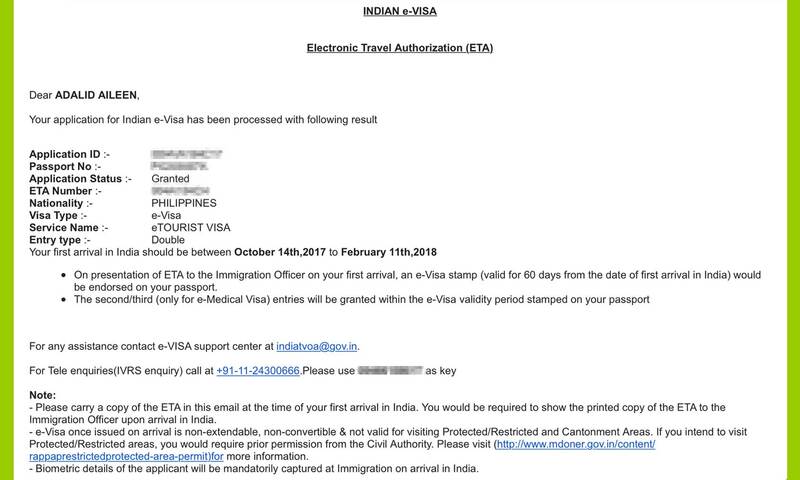 My e-visa was granted but i paid extra due to the agency fees.I had the best 3 weeks in North India last October 2017.I will be coming back on October this year again.I honestly didnt feel homesick during my stay and I love the country so much.Looking forward to move there permanently next year.More power and God bless! 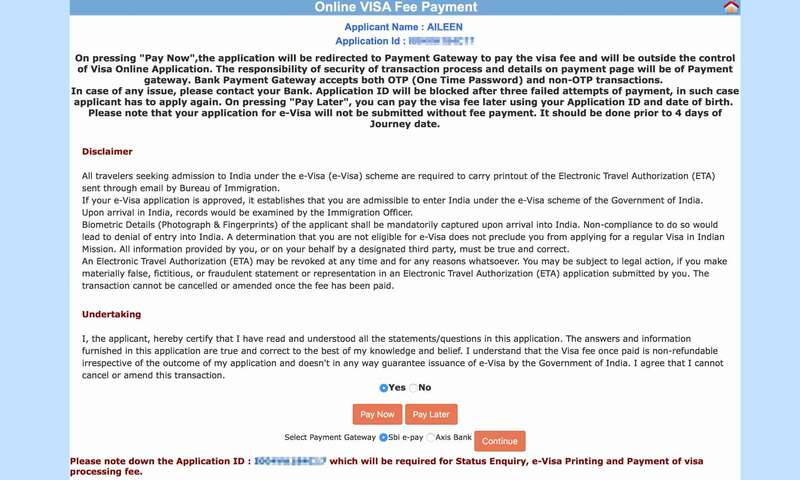 staying longer than 60days u have to apply for regular visa process and evisa is only for those who want to stay less than 60days and dont go to any agency the process is simple just open site and fill the detail dont double your money. and if u apply regular visa as u mention in your comment for permanent stay for when arriving so enroll yourself in frro in under 14days to supreme police office and get resident permit dont forget to do that otherwise huge penalty. Hi!I love how you made this so plain and simple and reassuring as well. Im planning to go to India this June but I wont be staying at any hotel. I'll be staying at a friend's. Will there be a problem for that? Thanks! Hey Roan! It should not be a problem; you can provide the address of that friend. Otherwise, you can also just mention a hotel that you intend to go to. The application online does not ask for proof of booking. Good luck! First things first, your fiance should be the one filing the eVisa application, not you. Anyhow, the requirements are not so strict online so she just needs to follow the steps above. Good luck! Sharing of your experience really is a big help as it is step by step and clear. Can I just also ask about your experience in the immigration officers in the Philippines? Hey Josa, thanks! As for immigration, thankfully, I've never had a tough time with them. But just for your assurance, just make sure that you bring documents like financial proof, hotel bookings, employment etc — just IN CASE they ask for it. It's really up to the whim of the officer if he wants to give you a hard time or not (haha truth!). So best to be prepared. Enjoy your trip! Hi Aileen... I applied for an E-VISA... it's been granted. In the email, I did not receive an attachment to print off. Are we supposed to just print off the body of the email? I'm happy to hear this helped! Enjoy your trip, Angela. You will love it! Really informative step by step process. Thank you. BUT after doing all of this and uploading the form, picture and Passport info, I have been unable, no matter what I do, to get my payment accepted and processed. Advice? Thanks. Hey Steve, that might be a problem on their website. You might need to contact them directly, or just use a different method of payment. Hope that helps.